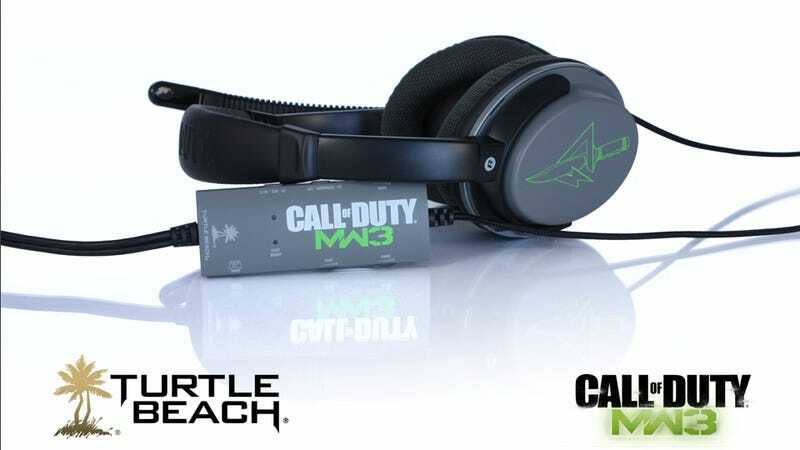 Just in time for Call of Duty: Modern Warfare 3, peripheral maker Turtle Beach is releasing line of MW3 branded cans for the Xbox 360, PS3, and PC. There are four different MW3 Ear Force headsets that range in price and features. At the top end, there's the Ear Force Delta. It's a Bluetooth-enabled, programmable wireless Dolby 7.1 surround sound headset. Priced at US$299.95 and for the PS3 and Xbox 360, it comes in a special carrying case and has custom MW3 presets and voice prompts. The least expensive headset is the $99.95 Ear Force Foxtrot, a universal gaming headset with high-fidelity audio. It's not uncommon for peripheral makers to slap a game name on their products for a big game launch, but Turtle Beach said these headsets have been optimized for Call of Duty: Modern Warfare 3. The presets and the voice prompts *should* appeal to the core MW player. These gaming headsets will ship to retailers this October. Modern Warfare 3 is set to go on sale worldwide on November 8.